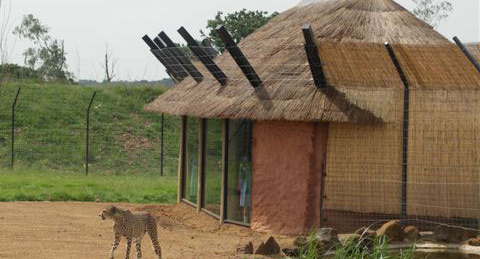 To clad and theme a new steel structure and create a natural, rustic visitor viewing area with walkways for a new cheetah enclosure. The project was particularly challenging as it was critical that new steel work was disguised with a rustic, natural finish. It was important that we worked alongside other contractors who were installing technical equipment and creating streams and pools within the enclosure. The oval, 75m2 roof was clad with tropical thatch and the underside themed with Cape Reed board and eucalyptus timbers, lashed together with natural manilla rope. The steel uprights were clad in irregular shaped, rustic timbers up to the glazed viewing area. 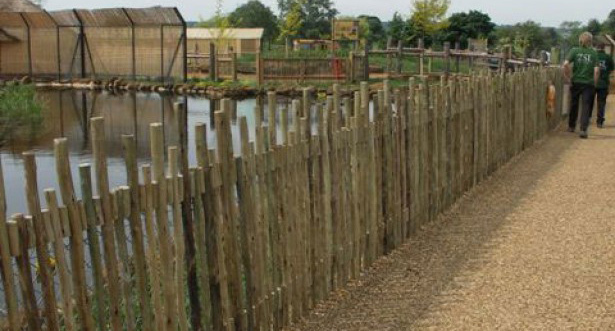 50m of rustic eucalyptus fencing with an uneven finish was supplied to theme the walkways and protect planting. The fencing was spaced to ensure that children had a clear view of the cheetahs. The whole project had a natural, rustic feel, and was completed on time and on budget.